The 2010 collecting trips were long overdue. After an absence from South Korea since 2001, it was satisfying while long overdue to be back there in the autumn of 2010. As we had suspected the changes there were enormous, primarily the infrastructure, both good and bad as it turned out. Bad in so far as returning to some of our old sites to replenish our collections, from what were old dirt tracks, that had disappeared under six lane highways. The flip side was our travelling time between collection areas was greatly shortened. The pace of change has been set, their economy may still be smaller than Japan’s, but their advances are surpassing with a strong ‘can-do’ mentality. Prior to our arrival we had been warned by our good friend Kihun Song that unlike previous visits the seed set of most plants had been poor over the summer months. This was due to weather conditions being not to the liking of many of the cooler growing plants, although there were still enough exceptions. Therefore on our first day we made a bee-line to re-collect one of the most ornamental plants of our trip. Aristolochia manshuriensis where the long sausage shaped seed capsules are to be found in a few sites from the eastern side of the country. It is becoming an ever more popular climber as people appreciate the beauty of its dramatic flowering on the bare twinning stems in spring, to be adorned soon after by large heart-shaped soft foliage which turns a glorious yellow in autumn. We were relieved on finding it, as demand is so high and propagation from cuttings is both problematic and unprofitable. Unlike its exceptionally hardy cousin, Aristolochia contorta grew on hot banks further south in the Waraeksan area, scrambling over large shrubs and scrub. Needless to say we will look forward to admiring its contorted funnel-shaped flowers in years to come. Shame its only hardy to around –20C. It wasn’t long before my new gismo came in handy. On my last collection trip to Taiwan the Natural Science Museum in Taichung had introduced me to a very handy (and more to the point…. inexpensive and compact) gadget for collecting seed or specimens from seemingly unreachable heights. Namely a telescopic pole, sold commercially as sea-fishing rods, which we were able to adapt for the said purpose. Thanks to my new equipment we were soon bagging quantities of Juglans mandshurica, not long joined by Acer triflorum and A. mandshuricum from Taebaeksan. Tall trees of Cornus macrophylla became reachable, while a heady Kalopanax septemlobus yielded a bumper crop of small purple berries, unable to repel us with its thorny trunk. While further south Daphniphyllum macropodum and Magnolia obovata surrendered their fruit without a wrenching climb along flexuous branches. This was not our only secret weapon, our good friend Liz Bradley (of needlepoint fame) had expressed an interest in joining us as our cultural advisor. With such dexterous fingers she proved to be a saviour when it came to our nightly seed cleaning chore. Does anyone out there appreciate how much fiddling and fumbling it takes just to get the seed home? Poor old Liz spent more time than she cared to think about slouched over a toilet bowl, rinsing seed. She also expressed a disappointment to be spending so much time in mountain forests, as opposed to subtropical islands….. you have to go where the plants are. All the same the scenery was breathtaking and we were all much fitter for trampling up and down mountains most days. Acquiring many new and interesting collections on our journey, starting in the north close to the border with North Korea in the cold mountains. Principally working our way south through the various rich mountainous areas treating ourselves to the occasional night on the coast for some civilised warmth. With one deviation to the remote island of Ullüngdõ for a few days of scouring for its endemics. Disappointing may be overstating this return visit, but some of our past successes were noticeably absent in seed, while new accessions were not that forthcoming. Meanwhile the weather also played its part in dampening our enthusiasm. It’s a long way to go for a couple of handfuls of seed. Despite the few setbacks, not long after this Liz left us for home with a hefty consignment of seed to transport to Crûg, enabling them to be sown long before our return. Ironic that within a week of her departure we had finished scouring the areas of mountain that remained and were island hopping along the south coast. Something that Sue and I had touched on during our first visit there in 1993, but this time we were determined to leave no stone unturned. Our future offerings will we hope reflect this previously untapped booty, in the way of some new Lilium and Zanthoxylum species that are new to us. As well as a puzzling Sorbus, whatever we had a great time before the cold weather finally moved in. It was a drastically different scene that greeted us on our return to Kihun Song’s nursery south of Seoul, as by now it was the closing days of October. All the vegetation was frost burnt, virtually no green left in the countryside while in surrounding fields the rice harvest had long finished. More days of seed cleaning followed as well as the few plants we had to wash, added to by Kihun’s generosity, some rare Polygonatum. Then it was up to Seoul on a perfect crisp sunny morning to meet up with Finlay Colley, who was joining me for a scout around some of my favourite collecting areas in southern Japan. With just enough time to make a quick dash to Ch'õllip'o Arboretum, where we met up with Chang Ho Choi the new curator. It was most interesting to see the changes made since Ferris Millers’ passing, best described as more visitor friendly. Some of the plants had luxuriated beyond recognition, such was the case with Persea japonica, which Chang Ho generously shared the seed with us. Just as well as we had not been able to find it on our search of the country, all we need now is some good germination. The 2007 collecting trips were beyond all our expectations. 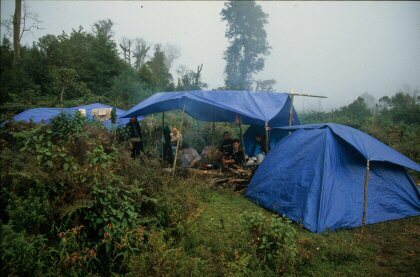 Peter Wharton joined me in the north of Vietnam, where I had been collecting with the aid of a motorbike. I had secured permits for collecting in a restricted area, where Peter would conduct a survey of this previously un-botanised area, while our Vietnamese host, Du was collecting specimen for his institute. The weather was dreadful, I wasn’t sure if I was going to end up with webbed feet or trenchfoot. Whatever, the collections kept on rolling in with new plants almost overwhelming us. By the time Peter and Du left I was under the impression that it could not get any better than this. Well it did. Sue arrived accompanied by Ben Kettle (from what was Rickard’s Hardy Ferns) again, despite the weather we came up trumps time and time again, you will not be disappointed in future years with these collections. Nor my following leg, which Sue unfortunately missed (running the mail order), was in Taiwan where I was joined by Dan Hinkley and Finlay Colley. Our hosts in the National Museum of Taiwan Natural Science, went way beyond their brief in helping us, which of course came to fruition in some wonderful collections. It had been eleven years since we had last visited The Himalayas, how things have changed in that relatively short time. Times have changed no doubt, along with costs which no longer appear to be third world. Looking back at our last collections (before booking) from there in 2002, accompanied with our friend Sally Goddard, our interests were certainly less woody. So it left us with plenty of scope to extend our range with new collections. This time we invited Finlay Colley from Ireland, who has accompanied me on a couple of previous expeditions, as well as Koen Van de Pock from Belgium. I had previously run into Koen in Vietnam, when he was accompanied by his wife Ann. They had been such good companions that we did not hesitate in inviting them to share the travelling, after all they had been great at seed cleaning (more of that later). All was arranged for an earlier time of the season than previously, mid September, which unfortunately meant that Ann could not come along, as their flower shop was still busy at that time. We had not managed to get to Sikkim before mid November on our two previous expeditions, which meant that our choice of collections would be greatly extended this time. Hence on the 17th we all met up in Schipol Airport, in time for lunch, before our flight to Delhi, which arrived at the delectable time of 2 a.m.. Been aware of the hassles we had pre-booked somewhere to lay our heads down before our continuing journey to Bagdogra, where we had arranged to be picked up and driven to the balmy climate of Kalingpong. One of the biggest hassles of these types of trips is all the equipment that has to be taken along, luckily for us KLM had an offer of a cheap rate for an additional bag, which we grabbed, as we would be even more heavily burdened on our return journey. Unfortunately there was no offer on additional baggage on our connecting flight to Bagdogra, which translated into three times the cost of flying a bag half way around the world and back. Back to the job in hand, the first hurdle was getting into Sikkim, which was duly seen to while we enjoyed a pleasant lunch, thanks to Sailesh, who had organized everything. In fact this character was busying himself finding out our every desires, what type of food or drink we liked what we would like to see etc. etc.. As soon as he realized that we all appreciated tasting new foods, he was off on a quest, we had hit a nerve, that and the demon drink were his pet loves. We were destined to try everything. We were soon installed in a suitably quiet hotel in Gangtok, while the permits to visit the north were organized. Allowing us to head strait out the following morning on the long journey to Lachung. As mentioned we had been along this road twice before, but we were still not prepared for the severe deterioration in the road. Apparently there is a major hydro-electric construction being undertaken in numerous sites up and down all of these deep valleys. This compounded by two consecutive years of major earthquakes had torn the area to bits. At least we were able to stop on route and collect seed of one of our primary target plants, namely Daphniphyllum chartaceum, which we found with plenty of fruit on a couple of trees close to the road. This was important as we not only required seed, but pressed specimens to prove that this species is quite different to D. himalayense, which it had been reduced to a synonym of. This task duly tucked under our belts was truly a great start to our trip, even if it was all that we had been able to collect on our first day in the field. It was well dark by the time we reached Lachung, but the welcome was warm as ever and we were soon installed in our temporary lodgings. Another early start was arranged for the following day, we were biting at the bit. No less so by the morning which had us piled into out vehicle and on our way north up the valley. Not that we got very far, we were stopped in our tracks by a stand of Actaea frigida, not far from the village, soon to be repeated by the sight of Angelica cyclocarpa, which must rate as one of the most spectacular species going with an inflorescence a meter across on tall chunky stems. That is one to look forward to seeing in full flow. The next one to hit us was the sheer quantity of Schisandra fruit that seemed to be hanging from virtually everywhere. The advantage of coming early was becoming apparent. It did not take long for another wave of fruit to crash over us, this time in the form of Magnolia globosa. Now I had been led to believe that this species needed careful siting in a garden to help protect it from cold, yet here it was at an altitude approaching 3,000m (as well as well above). It grieved us to leave so much behind, but you can’t eat it, whereas the birds can. Talking of which, the bird population was abundant and not shy either, reflecting the Buddhist philosophy of the Sikkimese population, who do not hunt anything that moves to extinction, as we have born witness to in far too many other countries. There were plenty of other lesser collections being found, inevitably at quite some pace on our first day, but some have to be mentioned. Aconitum bulbiliferum is no doubt a star if you can provide it with a cool enough position, we had collected on both previous expeditions in this valley, but this was deep purple in flower. Superb. So was the heavy crop of seed on Acer sikkimense, a species which had previously eluded us, possibly due to our late arrival. It will be interesting to compare it with our collections from northern Vietnam. Then last to be mentioned was Daphniphyllum himalayense, abundant at 3,000m, where it was forming colonies not quite on the scale of all the rhododendrons we were seeing, but never the less a prominent evergreen conspicuous because of its dark green glossy leaves, appearing to be one of the afore mentioned rhododendrons to the casual observer. As suspected the fruit on all of this species was still embryonic, a phenomena that as far as I know is a unique feature to this species, yet I have never seen a reference to it. 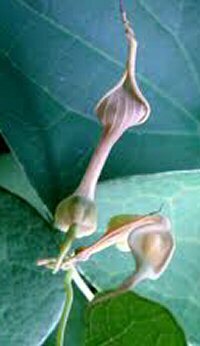 Is Daphniphyllum such a botanically/taxonomically neglected genus that nobody can be bothered to record such facts, hence the ludicrous situation with D. chartaceum mentioned above? 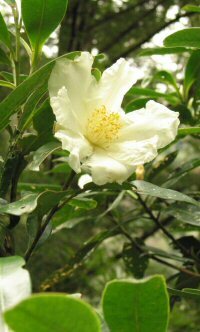 Or the fact that it is a perfectly hardy species, possibly the most hardy, yet all references in horticulture state it to be tender, probably like the rest of the plants we find at 3,200m in this part of the Himalayas? After a long evening recording the day’s accessions, I felt more than a little apprehensive, as we would not be able to cope with processing the quantity at this level, but it was after all still the first day. Next morning we were there again biting at the bit, but for our second morning I had earmarked a small side-valley, before we commenced further up the Lachung Valley. Reason being that we were after fruit of Merrilopanax alpina, having only been successful in raising a handful of plants from our previous visit and seen the public reaction to it on our Chelsea Flower Show stand. I had recorded it as being abundant in this one valley, I was proved correct. Not long after entering the valley it was apparent on the vertical sides, it did not take long to work our way up the side of the valley to a position where we could overload on its ripe fruit. If the plants we saw there are anything to go by we will not disappoint those forming an orderly que. We also took advantage of the large specimen of Rhododendron falconeri there with exceptionally large foliage well embellished with a gingery indumentum. Has to be in everyone’s top ten plants. Before moving on we were looking for a superb form of Sorbus hedlundii, which we had collected previously, the disappointment of fining it without fruit was soon forgotten, when I spotted some gorgeous foliage on a small tree. It was five-foliate, like a deciduous Schefflera ……….. with fruit in terminal panicles, we had to have it. We did! Gamblea ciliata will soon be topping many a shopping list, its going to be the next cool plant. Cool as it’s a good hardy species, fingers crossed it germinates. Feeling pleased with our morning’s work we made our way back up the valley, dipping into the sea of rhododendrons periodically. How do you select from one of the best populations in the world, not just diversity, but the quality of the species was outstanding. Herbaceous plants were also cropping up in some interesting guises Paris, Panax, Cremanthodium and Aconitum were all interesting, but it was one of the Rhodiola that impressed us the most. We found R. chrysanthemifolia growing on mossy tree trunks as well as vertical stone faces displaying their bright pink flowers against a tight ruff of deeply lobed fleshy leaves. Another plant that is destined to be popular. Curious as we had encountered this plant in the past, but never in this form nor at this stage with impressive autumnal hues. We had collected the white fruit of Sorbus microphylla in this area, but S. rufopilosa was new certainly to me, with longer more leafleted foliage and pink fruit. We had also come across Viburnum nervosum, but I could not remember finding it on this scale before, curiously or inexplicably absent from cultivation, it was difficult to believe that such a stunning and distinct in foliage species has not been introduced into general cultivation before. The valley was awash with its large curiously glossy distinctly veined foliage with plenty of its showy red turning to black fruit present to tempt all the bird life to distribute its seed. The following day started well with the discovery of a wonderful crop of Decaisnea insignia in the Lachung Monastery, which they were more than happy to part with, all be it a little bemused. It took a second take to recognise the curious yellow fruit accompanying the more familiar large pinnate foliage. This is also where we found the first of many ornamentally viable species of Impatiens, which will have to wait in line for their identity. If they all germinate we are in for a colourful display. This was also the day that we were to move west to the Lachen Valley where we encountered I. falcifer for the first of many sightings, a curiously shaped bright yellow species with red spotting in zonal patches. It was at the lower end of the valley that we also came across two magnificent Araliaceae, Brassaiopsis mitis and Trevesia palmata. Very much of the same vein as Tetrapanax, but taller, very imposing, and unfortunately without seed, but certainly on the list for the future. Here we also found our first selection of Hydrangea aspera subsp. robusta, one of if not the most impressive species in the aspera group. Curiously common for most of the length of this valley was Tetradium fraxinifolia forming small pleasantly umbrella-shaped trees with chunky pinnate foliage and large clusters of reddish fruit, which would later split to reveal the black glossy seed held within. Closely related to the increasingly popular Sichuan Pepper, we were not surprised to find it offered for sale in the local vegetable markets, as an alternative (or even better than) its Chinese relative. Again it is far too lengthy an exercise to list everything that we collected or saw that day, but the sighting of a small group of Shappy, a type of rare deer that were very rarely spotted was certainly a highlight. As indeed was finding Lindera heterophylla, just before we ran out of light that day. Shame we were too late for its black fruit, curious that it has been lumped with L. obtusilobum by some as its foliage is substantially different. Our final day in the Lachen Valley was, well a disappointment. Too much ground to cover left us too little time to investigate any areas well. Even when we gained some substantial altitude to well over 4,000m there was very little diversity left, what little seed there was had gone. We were mystified as previously the higher areas were good, but the military was crawling all over the place, not sure if they could be blamed, but only a single Meconopsis plant was spotted where as in 2002 we were able to collect three species alongside the road, with my noted recording that they were common here. We did find another species of Angelica though, although some authorities question there being two species in this area, it was equally as chunky as A. cyclocarpa, but only a meter tall, time will tell (germination willing). It was late by the time we had renegotiated the roads out of northern Sikkim, as our permits were expiring that day, we had to make our way to Mangan in the south. This left us with the prospect of a low elevation run back to Gangtok the following day, which we made the best of gathering more of the Hydrangea as well as several collections of Codonopsis. While entering the capital via some interesting experimental forestry areas, where we first encountered Exbucklandia populnea as well as Daphniphyllum chartaceum being grown for timber. Interesting. Back in Gantock was not to be a rest period, we had a mountain of seed to clean, which is exactly what we buckled down to do. All too soon we were on our way to the old capital of the country, Yuksum, which was yet another long drive, through some very pleasant countryside though. Unfortunately most of this was far too low an altitude for us to take advantage of, although we did manage to grab some Dobinea seed, just in case there was not any left in Yuksum.